The notion of belonging is interesting to me. I don’t come by it naturally and I’m not sure how many people do. I think growing up an only child of alcoholic parents might have contributed to that feeling, but maybe not. Maybe it’s just the human condition. Regardless, I remember so many times in my life when I felt I was an outsider or an imposter, so to speak. I have memories as a child of going to church with my friends (neither of my parents were religious, so pretty much the only church I attended was with a friend.) I can still see myself as a young girl kneeling in the church pew trying to join in the prayers and songs, which I clearly did not know the words to, moving my lips pretending to know the words. Fake it till you know it, right? Of course, no one in that church was watching me, but I felt as though a Hollywood spotlight was directed right at me. There’s the girl that doesn’t really belong here. I can’t even count the number of times I have felt that way in my life, but luckily experience has taught me that belonging comes in time if you choose to make something a part of your life. You have to work at it, and it takes effort, but if you do, there always comes the day that you realize you feel like you do belong. I find it’s still necessary sometimes to fake it in the beginning though. What I love is the day when the lightbulb finally goes on and you feel the connection, you’ve made it, you are right where you wanted to be, and you are no longer an imposter. You have become a part of the work group of friends, or are finally accepted on your soccer team by a group of players who have been together for years, or you begin to feel at home after moving to a new area. You don’t realize it as you move through the stages, for it’s a slow process. It’s kind of like body pain, it nags at you pretty consistently until one day you realize that it’s gone, as the ailment has healed. And it usually takes a while to even realize your pain is gone, but suddenly you take notice and embrace the blessing. I have to say, and again, maybe it’s because I grew up an only child, but damn, I LOVE it when I finally do belong. It’s a passage … it’s a triumph … and I cherish those moments. And for whatever it’s worth, it means all the more to me when it has been harder than most efforts. The harder, the better, because it means in the end I broke down the walls, I created a path, a connection with others, even when it didn’t come easy. There it was again, the club I didn’t really belong to. It’s interesting to me how many self-imposed limitations I can invent. Thank goodness, at this stage of my life I know to disregard that negativity and take the plunge, even if it feels somewhat like an ice-cold dunk. The amazing thing is the feeling when you get out of the ice-cold plunge, complete exhilaration. I recently purchased yoga clothing at Lululemon. For those of you who don’t know the brand, it’s awesome yoga clothing. Not cheap, but worth the extra dollars as their clothing is both comfortable and durable. And what yoga person doesn’t covet their bags? I’m never sure what I’m more excited about, what I bought or the bag it comes in. The bags are covered in inspiring uplifting messages about life and yoga. I took my lunch in one of their bags for years and would spend many a break just reading over the encouraging messages. That was the older version of the bag. The new bag is very sheek, black with white lettering or reversed, I luckily have one of each. 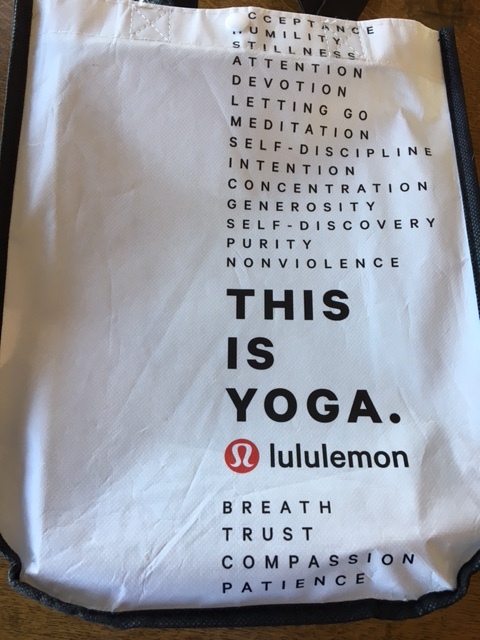 A few days ago I was waiting for someone and I started reading the bag’s wording, and about half way through I starting smiling, and of course my eyes filled with tears, because I realized that I now own this (no, not the clothing … yoga). I will take yoga with me wherever I go for as long as I am able. No club dues, no fakin’ it, just a love for an amazing practice. I have made it mine. We have no limit to our power when we learn to direct it. Just reading the words make me breath deeper. Yoga … this class … my life … all connected … yoga was just waiting in the wings for me to slow enough to return. I didn’t need this class to define myself, or believe in these principles. As I slip into my yoga clothing these days, it feels like an old prayer that I finally did manage so many years ago to make my own. It’s good to belong. When I read the beginning of this it reminded me of when we first worked together. I think we both felt like we weren’t sure how to act around each other because of where we worked and you had to be so careful. Like maybe you should or shouldn’t be working with this person. And then, we sort of just created our own “unique” group. I sit here just laughing about this because so much of it has been fun or funny! Ahhhh yes, enough said!